In the U.S., Labor Shortage Helps Baby Boomers to Keep Working in Retirement; Poll a Wake-Up Call to Employers Struggling with Labor Shortages. Many seem to be taking advantage of the tight labor market by working later into their retirement years or leaving retirement to return to the workforce. Among working boomers, 72 percent say they would like to “semi-retire” if they can have flexible hours. When asked if their employer ever brought back any former employees who are now retired to their company, 37 percent said yes. The majority of employed boomers (69 percent) say they are financially “prepared” for retirement, but only 27 percent say they are “very prepared”. While most express positive sentiments about their current jobs (82 percent), they also share doubts about their company not having an adequate successor who will replace them (56 percent). 72 percent of working baby boomers say they would be likely to “semi-retire” with flexible work schedules if they could. Of those who specified an age they plan to retire, 20 percent said in their seventies, with 3 percent saying they plan to retire “above 75” years of age. 48 percent said they plan to retire between the ages of 65-69. Older boomers are two to three times more likely than younger boomers to expect to keep working and don’t plan to ever retire. 6 percent of working boomers ages 54 – 59 expect never to retire. 9 percent of working boomers ages 60 – 67 expect never to retire. 20 percent of working boomers ages 68 – 72 expect never to retire. Most working boomers say they are at least “somewhat prepared” for retirement. Demonstrating the lingering doubts these boomers have, though, less than a third say they are “very prepared” financially. 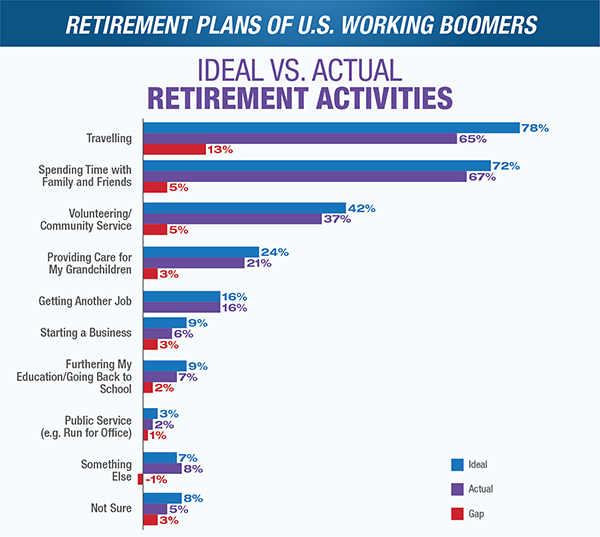 Employed boomers were asked about their ideal retirement activities-and what they actually expect to do in retirement. Traveling topped the list, with 78 percent saying travel was part of their “ideal” retirement. 79 percent are at least somewhat confident in Generation X (ages 39 – 53). 54 percent are at least somewhat confident in millennials (ages 24 – 38). 34 percent are at least somewhat confident in Generation Z (ages 18 – 23). More than half of employed boomers (54 percent) wish their employers offered more help transitioning to retirement. Those who are not self-employed would like help figuring out steps for retirement (30 percent), what Medicare will and won’t cover (29 percent) and transitioning to part-time work (24 percent). Yet, only 20 percent of working boomers say their employer offers “semi-retirement” options. 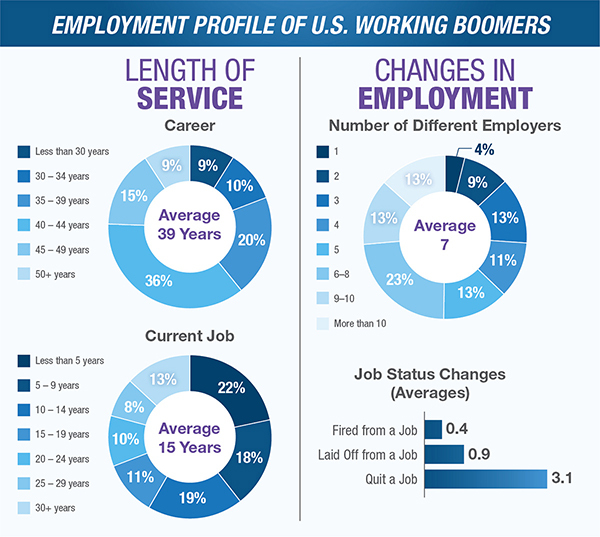 This study was conducted online by The Harris Poll on behalf of Express Employment Professionals and included 1,500 U.S. workers between the ages of 54 and 72 who are employed full-time, employed part-time or self-employed. Results were weighted as needed for age by gender, education, race/ethnicity, region and household income. Propensity score weighting was also used to adjust for respondents’ propensity to be online. Totals may not equal the sum of their individual components due to rounding. No estimates of theoretical sampling error can be calculated; a full methodology is available upon request.